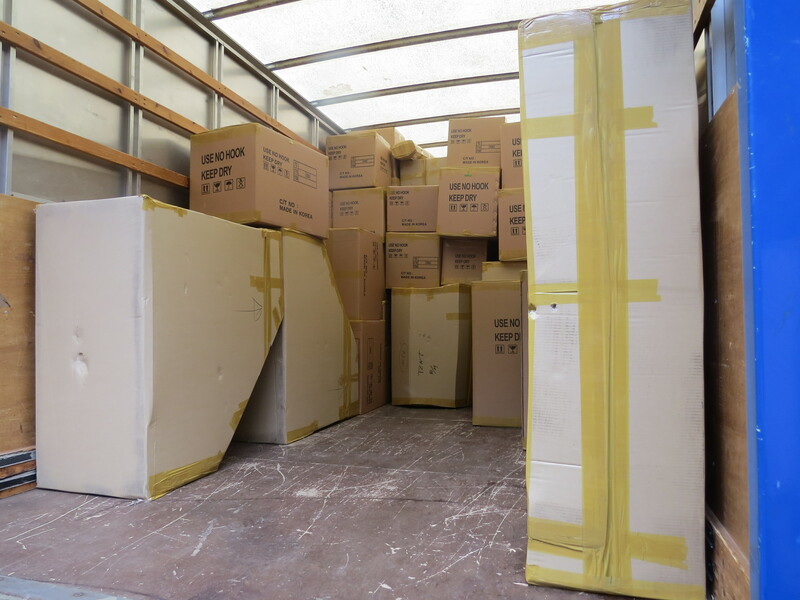 We got into our new house on Wednesday, when both the air and the sea shipments arrived, well nearly all the air shipment, 8 boxes were missing but fortunately they turned up the next day. 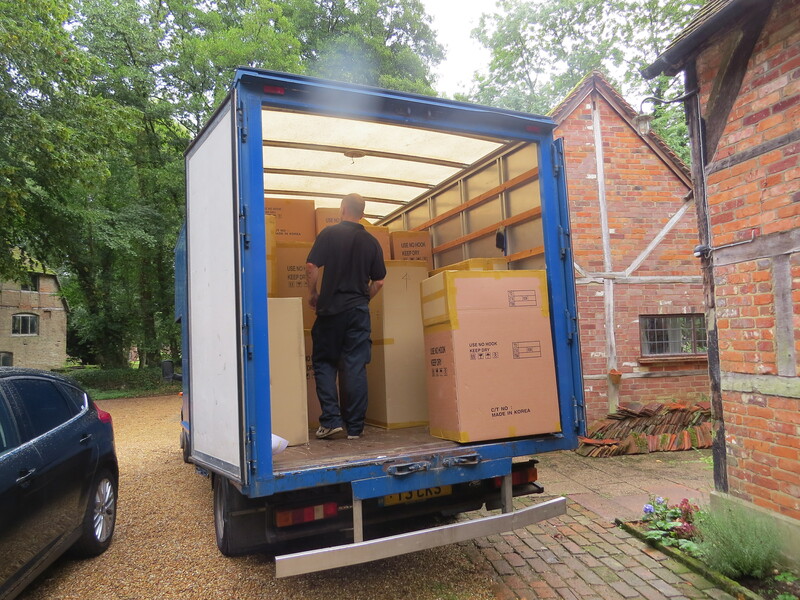 Wednesday was chaos, there were nearly 200 boxes to be sorted into different rooms and then unpacked, furniture reassembled and bedrooms made ready for that night. It took another few days to get everything else away but we are finally there and everything is sorted. Now has a seating area with a study at the back. Loads of kitchen stuff, all managed to find a home. The dining area also has comfy seats and the all important Lego tables. The found a bean bag and settled themselves out of the way. Things are mostly put away, but she keeps getting distracted finding stuff she hasn’t seen in a while. All sorted now, though our bed looks really small in this huge room. And finally the spare room, which is also Richard’s workshop – already being put to use. Really pleased that we have managed to get everything sorted so quickly, we still have the pictures to put up, which will happen over the next couple of days (we have to get housing to put the wall fixtures up) and then it will feel a lot more like home. Hurrah. Our sea shipment has arrived, 8 weeks after we packed it all up, so it took the expected time, but it still feels like a long time to be without all out bits and pieces. Though at the same time we have got completely used to not having it, and we were beginning to wonder if we really needed all that stuff anyway! Everything was packed into a container but that wouldn’t fit down our lane so the unpackers had to use this smaller van. As we didn’t take any furniture with us we didn’t have a huge amount. The floor was covered in felt blankets, which turned out to be very necessary as it was avery wet and dreary day, so different from when the air shipment turned up in August. Then was summer, not it is very definitely autumn. 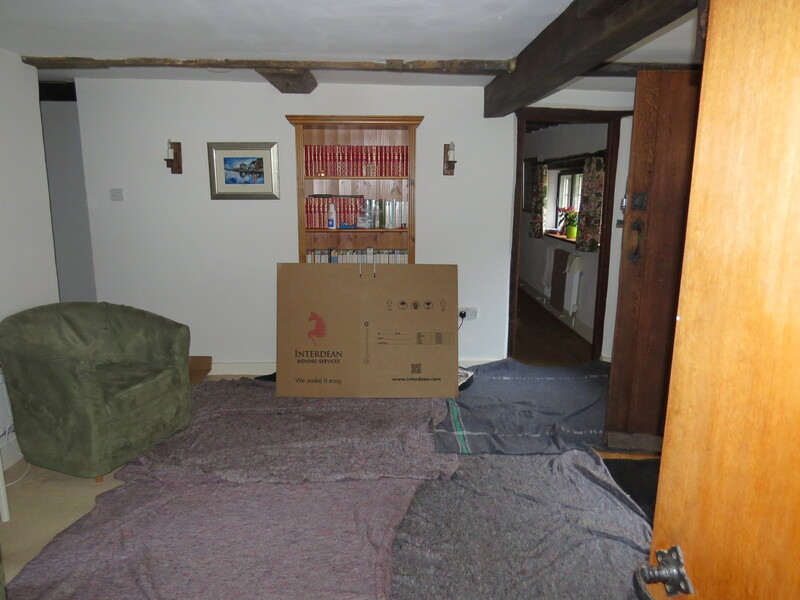 We tried to get the right boxes into the right rooms, and some were quite easy – all boxes marked kitchen went into the dinning room (not the kitchen as there is no where to unpack onto there). 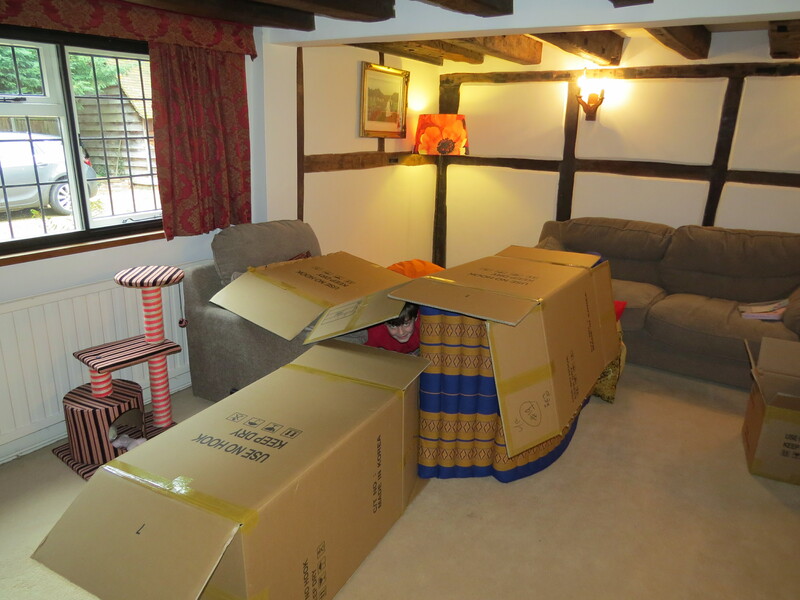 However most boxes were simply marked L/R for living room, and as we had a large open plan room in Korea it didn’t mean we wanted it in the lounge now. 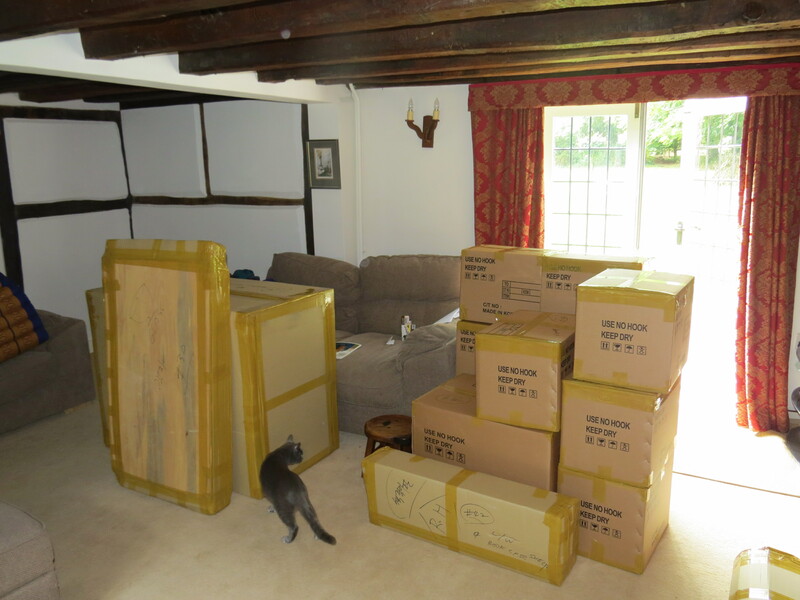 The room soon started filling up with boxes, and the cat tried her best to get in the way as much as possible. All the small boxes are filled up with books, which has been a real struggle to find a place for all of them. Still lots of boxes in the truck though. It only took till 12 to get all the boxes in and then the unpacking started. They were very efficient and a couple of hours later they were done. And I was left with a house full of objects that needed to be put away and an echoing silence full of how much needed doing. As is ever the case, it always looks like it will never go away and there is far to much stuff, and the first couple of hours doesn’t seem to make a dent in the piles of items but then all of a sudden you are down to the last book, last piece of clothing and final mug and then everything is away. Well, nearly everything. I still have to tackle all the toys – but they are all up in the attic room and happily out of sight can be out of mind.